A weightless, oil-free, mineral sunscreen treatment that absorbs instantly leaving no white residue. Physical sunscreens titanium dioxide and zinc oxide offer broad-spectrum protection from future damage, while clinical strength Pro-Niacin repairs past damage and promotes healthy, glowing skin. Use in the morning and throughout the day as needed. Apply a pearl-size amount on face and neck. Can be used on cleansed skin or over a moisturizer, followed by make-up. Active Ingredients: Titanium Dioxide 7.064%, Zinc Oxide 14.00%. Inactive Ingredients: Aqua (Water, Eau), Cyclopentasiloxane, Caprylic/Capric Triglyceride, Myristyl Nicotinate, Octyldodecyl Neopentanoate, Neopentyl Glycol Diheptanoate, Aluminum Starch Octenylsuccinate, Polyglyceryl-4 Isostearate, Cetyl PEG/PPG-10/1 Dimethicone, Hexyl Laurate, Stearic Acid, Polyglyceryl-3 Polydimethylsiloxyethyl Dimethicone, Cetyl Alcohol, Magnesium Sulfate, Caprylyl Glycol, Alumina, Tocopheryl Acetate, Bisabolol, Parfum (Fragrance), Dimethiconol, Isostearic Acid, Lecithin, Polyglyceryl-3 Polyricinoleate, Polyhydroxystearic Acid, Aluminum Hydroxide, Benzotriazolyl Dodecyl p-Cresol, Polysilicone-11, Disodium EDTA. This product leaves a very noticeable white cast after application despite the product description. Especially in areas with stubble. It is also not suitable for wear in warm weather or doing activities where I might sweat as this is not water resistant. I knew this before purchasing but did not anticipate the horrible sting I felt in my eyes. The product did have a noticeable brightening and evening of my skin, which I liked. But what's the point of a sunblock that can't be worn under warm conditions? I would not recommend. Thankfully ThatGuy received this as a sample and didn't buy it. The sunscreen is white and goes on easy and spreads evenly. But, for my skintone (fair - mid) it left a ghostly blueish/purpleish hue on my face. I'm sure a girl can cover this up with makeup, but this is not very becoming on a guy. I gave it time, thinking it would soak in & go away but it didn't. One positive is that it smelled really good and it was not oily at all. I started dropping chemical sunscreens a year ago. This one works very well as a mineral. Sun damage could be seriously awful in AZ but this one prevents my skin from being hurt. I didn't notice any sun damage. Plus, it leaves my skin look delicate and even. Like it. A little bit white and sometimes, though occasionally, clogging, but it's fine. I have very sensitive skin, but this one doesn't hurt at all. I love this sunscreen. I have very sensitive skin and this is a product I searched for. One that protects me from the sun (have already had skin cancer on my face) but doesn't cause break outs. I even have my daughter using it and she loves it too. I have used Nia24 for several years, it is very effective and I highly reccomend it. The best sun screen/day lotion! I've tried it all, this is by far the BEST day time lotion/sun screen. I've had so much compliments on my skin since wearing it. I've also started using their other lines b/c of this product! SUNSCREEN AND I HAVE TRIED MANY. SO FAR THIS IS THE BEST. IT ABSORBS QUICKLY AND LEAVES MY SKIN FLAWLESS MY FIANCE TELLS ME THAT I HAVE THIS NICE GLOW. LOVE THE NON-GREASY FEELING. IT DOES NOT SMEARS EVEN WHEN WORKING OUT OR DOING YOGA. This sunscreen had a luxurious texture and is my favorite of all of the mineral-based sunblocks. It feels like a primer. If you use foundation over it, it will not "pill" - it works like a charm. I prefer using mineral sunscreens because the effectiveness of chemical sunscreens diminishes upon application, which means that within 2 hours, it is no longer working. Not practical unless you want to be reapplying your makeup all day long. I have combination-oily skin, I've been using this sunscreen for weeks, and have not had any breakouts. I have sensitive, acne prone, combination/dry and sun damaged skin. I seem to always break out from sunscreen and seemed like I tried every one out there that promised no breakouts to no avail. 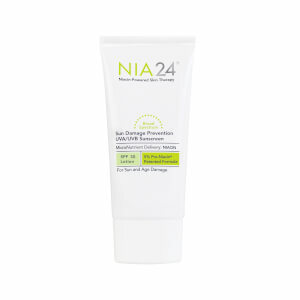 Finally I found Nia24 and NO Breakouts! It also appears to make my skin look and feel better. I never go out without it now. I put it on under my mineral foundation and looks great not greasy. It is alittle pricey, but not as pricey as buying bottle after bottle and having to throw them away. Highly reccommended! Like another reviewer, I am extremely allergic to chemical sunscreens. I've tried the stuff advertised to be gentle enough for babies, but I end up rashy and itchy anyway. So, I have to take extra effort to find a good physical block that won't make me look like a lifeguard with the heavy white stuff. I love this mineral sunscreen. It's weightless, absorbs quickly, and doesn't leave my face shiny or greasy. It's an added plus that NIA24 is good for my skin. I will definitely come back for more.